I have mixed reviews on this truck. I tried it for the first time today and I loved the Midnight Moon sandwich. The Goat Cheese was deliciously paired with caramelized onions on a multigrain bun and it made a simple grilled cheese taste very elegant. The tomato soup, on the other hand, was very bland and I was very upset with that - a wasted $3 since I did not finish it! I will give this truck another shot since I liked the sandwich so much, though! The flavor profiles here are good. Sourdough was golden, a good amount of mozzarella that was actually stringy heated goodness, ripe tomatoes, and fresh basil pesto. The gazpacho was tasty, albeit a little overpriced for the portion size, imo. However, I'll likely return to try some of the other flavors. Glad to happen upon this in Ballston. I was a little disappointed with my sandwich. There was barely any cheese, and a very small hunk of onions in the middle of the sandwich. I mostly tasted butter on the bread and not the grilled cheese. It was definitely lacking something. I am giving it 3 stars because the workers were very friendly and seemed grateful for the service. To big cheese: consider adding tomato, or other toppings, and more cheese on the sandwich. not much food at all for 11.50, and quality was average at best. Overpriced for both quantity and quality. Will likely not be dining at this truck again. After some awkward chit chat with the guy in the truck, I ended up ordering the Mt Fuji sandwich. Meh. It's pretty hard to screw up a grilled cheese sandwich, but this was certainly nothing special and hardly even worth the money. The sandwich sounded fancy and all of its individual ingredients tasted fine. But for the money, I thought there would be more to it. 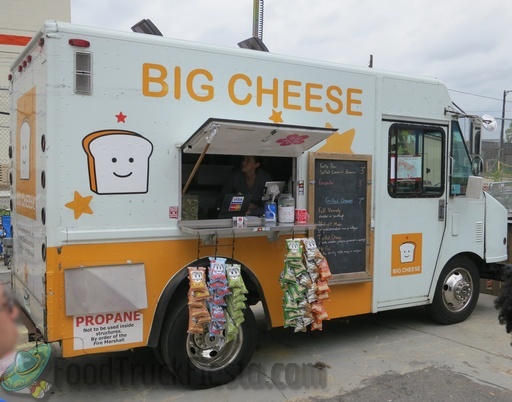 I was expecting a truck called The Big Cheese to actually serve gooey cheese-filled sandwiches that were better than what I could make at home. My mistake. The Big Cheese truck is my favorite truck in DC! I have skipped Truckeroos if they are not there. The Midnight Moon is my #1 go to. The goat cheese is so delicious and blends perfectly with the onion and multigrain bread! My mouth is watering just thinking about it! Thank you, Big Cheese!!! Without question, this was my favorite food truck meal. Your sandwich is awesome; it definitely adds a little "extra kick" to Mom's old grilled cheese with friendly customer service. the sandwich was chewy and barely had any cheese on it. the flavor was tasty. the soup was good. just WAY overpriced for what you get. Overall the food was mediocre. The wait was entirely too long (approx 20 minutes). The soups were bland. There was a piece of hair in my coworker's sandwich. It could have possibly come from that morning when they were pre-making the sandwiches, but I can't call it. 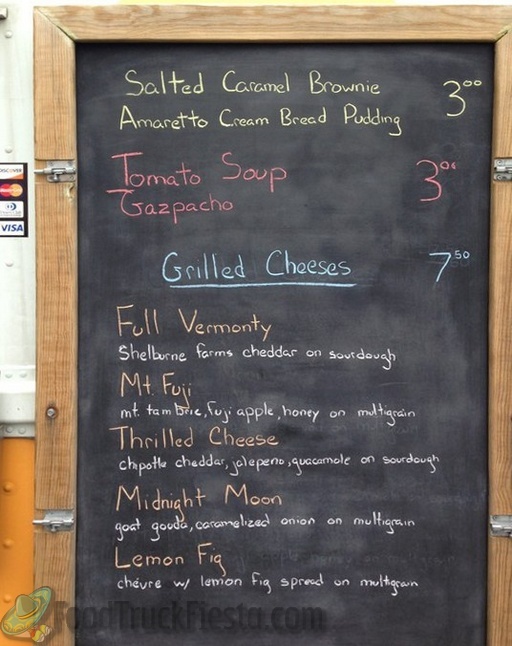 The Big Cheese is permitted in Arlington, Virginia & DC and serves foods based on the Cowgirl Creamery cheeses. The official launch date was December 13, 2010, although the soft opening occurred one week earlier.